These three elements work together to ensure the correct price for the correct product is quoted and documented based upon the information known at the time of the quote. There is considerable variation in how individual systems on the market execute these three processes. There are also numerous additional features available that deliver a variety of “must have” and “nice to have” capabilities. These features may offer add-on functionality, but they also may reflect a different approach to executing a specific process. 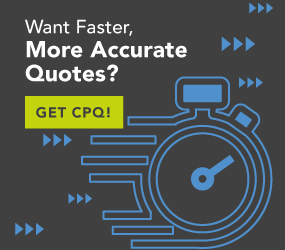 What are Advanced Features of a CPQ System? We will examine a number of these and look at why they are important to your search for the best configure-price-quote software (CPQ) system. Acquiring a CPQ system is a great way to improve the quality of the customer experience delivered, ensure accuracy in your order-processing and production processes and increase sales efficiency. Price lists, part lists and product information all present security and administrative challenges. Any tool or system that regularly accesses or uses this data must be built around established protocols and practices that ensure the protection of the information and maintenance of your proprietary data. Your IT group can work with you to determine what protocols, practices and technology are appropriate for your enterprise. Certain elements associated with usage and security should be maintained within the IT infrastructure. At the same time, administrative functions such as user authorizations, price updates, product information updates and other maintenance functions will need to be available to management and administrative personnel in the field or within the sales organization and product management groups involved. These individuals are best suited to identify what functionality should be made available to each specific user. They will regulate who authorizes discounts and who has access to promotional or country-specific pricing. The system is secure, and the price-related decision-making process is deliberate and controllable. Complex products, pricing and product-usage scenarios that drive product content and configuration options represent a maintenance challenge. Data tables that match product SKUs with part numbers, prices and specific configurations are cumbersome and difficult to maintain. Accuracy suffers, and the resulting product configurations may be invalid. Additionally, this cumbersome maintenance process may produce inaccurate quotes and ultimately products delivered that do not meet the challenges the customer faces. Utilization of a business rules engine offers a much cleaner and easier-to-maintain alternative. This will eliminate the endless updates of product and pricing tables and relational restrictions that govern the selection of parts, options and prices. The business rules establish the permitted and prohibited combinations of product, price and customer in context with the inputs that the customer provides. Most enterprises that offer complex products operate in multiple geographical locations that cross borders and continents. Each country has different currencies, and in many cases, prices will vary in ways beyond simple currency conversion. Major or high-volume customers may purchase your product for use in multiple locations or in great numbers. These customers may qualify for favorable pricing agreements such as a national account or strategic account status. Other markets may require special pricing as well. US government entities frequently request GSA discounts for products acquired in lieu of competitive bids. Each of these require a separate, specific price list. New products or even mature products may be promoted via special marketing programs that feature discounts and special pricing. The result is that any product may have many individual prices that may be invoked under certain conditions. This ability is critical to any seller who wants to establish value-reflective pricing driven by specific conditions and usage parameters. Interactive communication between buyer and seller drives a guided-selling quoting and ordering solution. The seller’s own inputs drive the responses presented, options offered and configurations built to address the buyer’s requirements. The guided-selling process is facilitated through a scripted interviewing application that initially asks generalized and more open-ended questions. As the buyer supplies answers, follow-up questions are posed that become more focused and precise. Answers to these questions result in recommendations driven by expert knowledge enabled through AI. These take the form of possible options, alternative solutions and other even more specific queries. At the conclusion of the interview, a fully configured product is proposed for the buyer and seller to consider. Computer-aided-design (CAD) capability is essential to providing a 3D visual representation of what the customer is purchasing. Complex products are many times difficult to physically envision. CAD provides the added assurance the buyer and seller need to feel confident in the solution proposed. The advantages of producing a professional-looking, detailed proposal are numerous. It provides a written record of what is being purchased, what the performance expectations are and justification for the pricing quoted. A superior sales quoting software and proposal solution should not only easily deliver sales quotes, it should also scale up to provide faster, cleaner proposals that are aligned with the customer’s needs in terms of product detail, justification and proof of efficacy. Automating this process saves vast amounts of time, especially for your most productive reps. Instead of writing cover letters and gathering sales collateral, your reps can spend more time selling. Marketing departments love automated proposal generation because it ensures that visual branding standards are met and that the products being sold are accurately presented. Configuration-Price-Quote processes are not standalone functionally within your organization, and they should not be standalone systemically either. Financial systems depend on accurate pricing data for profit calculation and compensation operations. Supply chain and inventory systems communicate back and forth with the quotation system to establish availability of parts. The order-entry system is greatly enhanced in terms of accuracy through the automation of the order-entry process that is facilitated by the price quote system. Multi-level bills of material (BOMs) are generated, and the production scheduling system is triggered to marshal the manufacturing processes required to fulfill the order. All of these processes will smoothly occur in a sequential, seamless manner. Acquiring a CPQ system is a great way to improve the quality of the customer experience delivered, ensure accuracy in your order-processing and production processes and increase sales efficiency. These features deliver the functionality required for successfully serving your customers with a superior customer experience that focuses on their specific needs. The days of knocking down the price 5 percent at close to get the order are long gone. Customers want products that closely align with their individual needs and requirements. Pricing and quoting software, driven by guided selling and robust configuration technology, ensure that the product proposed fulfills the customer’s needs at a price that is equal to the value delivered.